Excellent work. Looks really really great. This would be more software work but a lot easier mechanically. But now try to fit that into the space of the original HP device and make it look good. Unless you have an elongated graphics display in the dimensions of the original it's replacing, it's probably going to look very ugly. Your example display would probably fill up only half of the horizontal space available. You may have some additional space and put in a larger display that's mostly hidden by the enclosure, but how elegant would that be? I think the elegance of the OP's solution is how it fits so perfectly and looks as though it should have been there from the start. Great job! I've found that to be a major drawback to the HPs with LCD readouts. If you are doing work...it's a real pain to read the display. they use a standard protocol for programming. Could use the information for the CNC too. Oh darn this is great! I have an 3478A and the display is basically driving me crazy... I really hope you release more details about this project as open source so I could get this otherwise great device to be even better! I'm mostly intrested in the protocol details and what discreet logic you used to help you out with the SPI compatibility. I mean it's all about those details and everythign else is how one wants to tackle the issue. I was considering a graphics LCD myself for the replacement since I don't own a CNC. Support the KiCad CERN Branch! I am back from my business trip, I will answer the questions and post more details (schematics, ...) on the upcoming week. I have already posted the protocol, I hope everything is clear? I will also see if I can provide some replacement kits at a reasonable price. Great job on this mod! Awesome Work on reversing this. I'm thinking of replacing the display in my HP 4263A LCR Meter, which is (i guess) the same kind of display. This will save me a lot of work :-). I thought someone did the replacement in the 4263A already, but can't find the thread. VERY nice! The guys at Time Nuts have complained about displays for the 53131A/53132A counters going bad. This would be a very popular fix for those units!!! Great work mate and I'm sure you've just inspired many more to follow. I really appreciate the work of Xavier for this great substitute for the HP series. Here is a HP3457A, a Agilent 4263B and others lacking in the Display department. May i kindly ask you to post/share the firmware and the layouts of your PCB as you proposed. for the people who haven't got access to a milling machine. 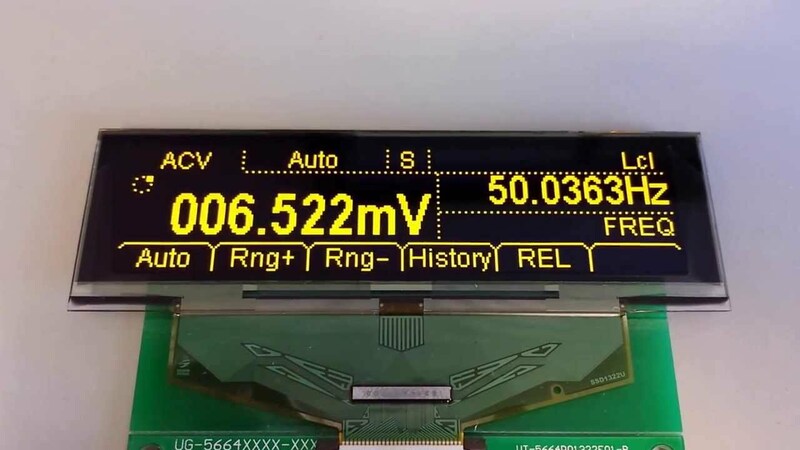 As far as I know, thats the same LCD Display module used in the HP 6624 Power Supplies (the "tank"). I planned to replace that module as it's readability is quite bad - thus your great work may help a lot to make that project reality. It is distributed under the open source GPL licence, please comply with it. As you may have noticed, they did it completely wrong They didn't follow my instructions (wrong dimensions), neither they worried about drilling all the holes at 0.8mm diameter, telling me that my files were wrong (the same files that I used to make my prototype ). Anyway, this is still in progress, and for now I want to keep the PCB design and try to make a kit with it. If it doesn't work, I will provide the PCB files too in the future. As suggested by tggzzz, I measured the AC noise across a 100k resistor with the LCD display and just after with the LED display, the good news is that I can't see any difference in the value measured between the two displays! (Only one digit is lit trough a 1k2 resistor 5V => about 3mA ; as you can see, surrounding digits are also lit a bit, even-though they are not powered (one of them is even shorted)). So the only advantage of this High Luminosity version is that it consumes less power! This is an awesome project and I've been following it for some time, even though I don't (yet) own a 3457. If I did, I would totally buy a kit and I hope that you're able to make a bit of money off it! Well done! Agreed, you have done an awesome job with the and deserve to make at least some money from it. I'm not sure if you are aware of this or not but the links you provided do not work? If you decide to sell PCB's etc, you have a guaranteed sale here! You know a forum is big when you've missed an awesome hack like this for so long. Great job, Xavier! I must say I like the yellow display more than the red, even if there wasn't light bleed. For some reason the yellow LEDs go better with the look of the 3457A. I must say I like the yellow display more than the red, even if there wasn't light bleed. For some reason the yellow LEDs go better with the look of the 3457A. Same here. Our eyes are more sensitive in the green part of the spectrum. So even with equivalent luminance, the yellow would appear to us to have better contrast. Xi, that is fantastic work you have done there! Thanks very much for your efforts in decoding the protocol and making your findings available. I've only skimmed what you've provided, but it looks scary complicated at first glance. I have three HP3468A's, and I can't stand the LCD displays on them. They seem to use the same part for the display as yours, with the same signals, so your project is of great interest to me. I can't find the part (5061-1166) in the HP3457A manual, as it seems to be part of a larger assembly. The processor in the 3468A is different (1820-2718), an 8039 (from the Intel MCS-48 family), but it's also used in other HP test gear. I have been thinking about something similar for the last year, and just found this thread, which tells me that it's doable. * Hack the firmware, replacing the display protocol entirely. To this end, I wrote a "smart, interactive" disassembler for the 8039, so that I could see how it talked to the display. The disassembler still needs more work, so almost no progress on unraveling the ROM code so far. In any case, your protocol "specification" will be invaluable in deciphering the contents of my ROM, thanks again. Awesome work, xi. I've worked on the 3478A firmare and can confirm almost exactly the same LCD protocol, with one minor interpretation difference. In the code, they send instruction words as 8-bit bytes, so for instance "0x0A" for "write reg A". The 2 bits difference is easily explained : in your analysis you shift in the 2 bits (always 0) sent while "CS" is high. In the end it makes no difference though, the actual data exchanged seems identical. Also, I've emulated the 3478A to a limited extent in MAME , for testing firmware hacks. Current status is rough WIP, no keypad, AD LINK FAIL (of course), no CAL RAM, no GPIB. A MAME DMM? That's cool. So add me to the list if you start selling kits. I'd actually prefer to stay with the original LCd, but I doubt I'll be able to find a drop-in replacement. You may want to look at taking the LCD from an hp 3488a - it think they are interchangeable (but you should verify). You can usually find these pretty cheap on eBay. However shipping it is sometimes more than the unit costs. However you might see if the seller will just ship the front panel or display PCB since that would lower shipping cost. There is not much in HP 3488A unit so you wouldn't be losing much junking the rest of the unit if you are just interested in the LCD. I just saw two on ebay (unfortunately for Europe buyer it is in the US) for $15.00 but shipping in US about $20.00.